I chose the "burgundy" colour. Yes, I know that real henna is red -- this has natural ingredients to boost colour. Today is henna day, folks and I’m very excited. As I told you a few days ago, I’ve never tried henna because it very time consuming and my weekends are pretty busy. Now that I’m working from home, I can do things like a henna treatment and leave it on for the entire workday. The purpose of me trying this out is two-fold. First of all, I’m sick and tired of these grey hairs. For real, they are bothering my spirit. I began to go grey about five years ago when my dad became seriously ill. Since then, they have been multiplying and quadrupling on my head and making feel that I look more mature than I really am. So, I’m hoping that it will get rid of that. Secondly, and more importantly, I heard that it’s really conditioning and will strengthen my hair, I believe, over the course of time. In about a half an hour, I’m going to try it. I’m a little fearful. 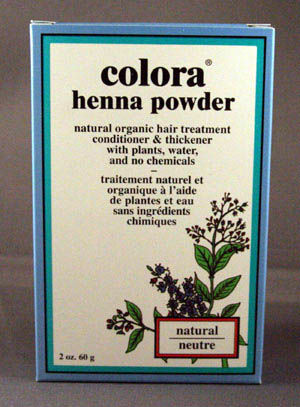 I’m using Colora Henna — not the creme, the powder — that I got from the Big Carrot (a health food store in Toronto) about six months ago. Umm, no. I may wash it out in the basement, but I’m applying it in my bathroom. Anyhow, I’m wondering if any of you used henna? What brand? (I’m intrigued by Lush’s cacas — why they used that name is beyond me.) What did you think? Do you do it regularly? Why do you use it? Why don’t you use it? I’ll update over the weekend with pictures and let you know how it went. I use box henna too. I go with bright red to perk of my flat brownish hair, and I think my brand is High Mountain, or Wolf Mountain or something like that. I try to henna every three weeks. It makes my grays, what few I have shimmery coppery highlights and I do believe it strengthens my hair. I like to add a lil bit of Olive Oil and nutmeg to mine it makes it smell better and the olive oil makes your hair shine more. I didn’t know about the olive oil. I mixed it earlier in the week — I was trying to do it on Wednesday. When I realized that that wasn’t going to happen, I put it in the freezer. Next time — if there is a next time — I’ll definitely put some olive oil in. I’ve had it in for an hour and I’m seeing some colour. Woo hoo! And, it wasn’t as messy as I thought. Four more hours to go. OH!! Good luck with the whole process, fingers crossed u get some awesome results! I have a pack of Jamila Henna at home…haven’t thought to use, must do a bit more research. But really looking forward to seeing your results!